Walking on the snow is more of an art form than a skill set. With the right snowshoes, though, you can traverse the snowy landscapes anywhere with ease. Which ones are the right ones, though? With so many different brands, models and features to choose from, how do you know which ones to choose? While it can be a harrowing task to find the best snowshoes for you, we hope this list makes it easier for you. We have scoured the internet looking for the best of the best, and we bring all of our research and findings to you, so you don’t have too. Our rating system is based on a five-star scale. We don’t just arbitrarily come up with these numbers though. Hours of research and testing goes into each score, and we display them proudly. We understand that there are a lot of factors that go into deciding on the perfect pair for your needs. Not only is size and weight important but so is location. The snow is different depending on your location and the right shoe for Denver may not be the right shoe for Alaska. We account for drifting snow, snow depth, packed snow or freshly fallen snow. We even take into consideration the altitude and average temperatures. The shoes themselves should be multi-faceted to allow for different terrains. However, if you are just using them to check the mail, you will want a different pair than you would if you are on a five-mile trek into the wilderness. The bindings are important as well if you end up with the wrong type you may develop sores or blisters. While some will slip on over boots, some have boots built in, which can pose problems either way you go. We also look at the bounce, the weight distribution, and the construction materials. Durability, ruggedness and expected lifespan all go into our research for the best shoes on the market. After our research and testing are done we go online and out in person to see what actual customers have to say. We listen to their complaints and their commendations. We listen as they explain any difficulties they had or experiences with the snowshoes that caused them concerns. We then take all the good, all the bad and all the aspects that are more user error than product fault and we add that to our research. In the end, each snowshoe has a numerical rating that we transform into a star scale. The best of the best get the highest marks and the highest marks get the most stars. What all this means to you is that we have done the research and testing for you and present to you our findings. While we understand that the ones we find to be the best may not suit your specific needs to a T, we are sure that you will find enough options listed here to make a well-informed decision for your next pair of snowshoes. The following is the list of the best snowshoes you can find according to our research and testing. We are confident your next pair of snowshoes is somewhere on this list. 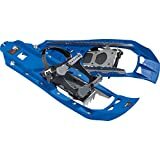 Chinook Trekker snowshoes are made from a sturdy aluminum framing that supports and distributes the load weight evenly over a large surface. The decking made from polyethylene that is resistant to freezing and cracking in the cold temperatures. What sets these snowshoes apart is the easy to use, quick release double ratchet strap bindings. You just slide your boot in and push the lashings until they are tight. Each click is secure and won’t slip until you release them. When you are trail walking, the heavy-duty aluminum crampons work well. There are heel crampons that bite into the surface and prevent slipping. The toe crampons rotate freely to ensure a solid grip on all terrains. The Chinook Trekker snowshoes come in five sizes (19, 22, 25, 30 and 36 inches) for a load limit range of 90 to 300 pounds. When fashion meets functionality, you’ll find ENKEENO all terrain snowshoes. The sleek design distributes the load weight from front to back allowing for a thinner shoe size with a longer footprint. The upturned tail makes walking easier for added comfort. The design virtually eliminates the “penguin stride” in favor of a more natural stance and gait. Each shoe has a double ratchet locking strap style lashing that will fit most boot sizes and styles. The heel mount isn't a click-in style but instead a comfortable and flexible elastic strap. When you walk in the shoes, the aluminum alloy frame will provide support and balance while bearing the brunt of the load weight. The crampons are made from forged aluminum and are stationary in the instep and heel. Extra traction comes from the hell crampons ability to bite into snow and ice at any angle. The polyethylene decking material has excellent floatation, keeping you upright and moving forward. If you are looking for value for your money, the G2 series has you covered. Everything you need for a trail adventure is held inside a carry bag for convenience. Inside the carry bag, you will find the Go2Gether snowshoes, three-piece aluminum trekking poles and winter baskets. The foam padding handles on the trekking poles give you ergonomic grip, and the optional winter baskets keep the poles on top of the snow surface instead of plunging into it. When you aren’t on snow, the baskets can be removed for a trail trekking pole in all conditions. 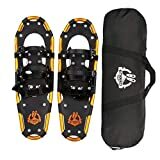 The snowshoes themselves are made from a high-grade aluminum alloy that will distribute up to 250 pounds (200 pounds for the 25-inch shoes and 150 pounds for the 21-inch shoes). The crampons are molded in manganese for all-terrain grip and excellent durability. The shoes feature a heel lift system that allows you to traverse uphill without having to waddle. Cushion and support in the Adventure brand flex pivot band keep you on top of the snow with a feeling of walking on clouds. The bindings fit most shoe and boot styles and size allowing for easy in and out with the click of the ratcheting lock. ALPS brings you a slightly different style and material in their snowshoes. The trail kit comes with the pair of shoes along with two trekking poles with anti-shock adjustable poles and optional winter baskets. You will be able to carry it all in the ALPS carrying bag. The shoes are constructed of the ultra-lightweight 6000 series forged aluminum. Even weight distribution gives the frames the ability to carry up to 250 pounds (with the 30-inch shoe). If you have less weight to carry you can choose from four sizes ranging between 22 and 30 inches (22, 25, 27, and 30). The pivot band is made from lightweight Nytex which holds up well in freezing conditions without splintering or cracking. These shoes are not designed for mixed-terrain and when not on snow should be removed. Because of the lightweight aluminum frame, rocks, limbs, and other trail hazards could cause them to dent, bend or become deformed, lowering their ability to distribute weight evenly. In the words of Monty Python, and now for something completely different. MSR brings you a molded plastic framed snowshoe that carries and distributes up to 180 pounds. For an additional purchase, you can get the EVO tails that lock onto the rear fin and allow you to carry up to 250 pounds. The crampons are also different, opting to remove the heel crampons and instead use two spiked rails that run along the side edges for added traction in all conditions. The instep crampons grip as your foot pivots and the shoes chunk along without you worrying about slipping on any terrain. The bindings and lashings are glove-friendly and lock into place with a pinch-and-latch design. The entire shoe is a redesign from the ground up and will certainly turn heads as you tromp through the snow-covered trails. The instep crampons are actually a part of the bindings and will pivot with your foot instead of being mounted to the underside of the shoe. The effect works much like a skaters tow-pick grabbing only when you put your weight on it. Finding the perfect pair of snowshoes can be an arduous task. More difficult than picking out a pair of sneakers, you need to be sure that the shoes fit, as well as support your weight and the way you walk. There are several factors that go into choosing the right snowshoes, and it isn’t always as easy as trying on a pair and walking around the shop floor. The frame is one of the most important aspects of the snowshoe. The material used needs to be sturdy but lightweight. Aluminum is common and works well, although it can dent and bend if the trails are full of hidden rocks or obstacles. Aluminum alloy is used to help strengthen the frames. However, it comes at the cost of added weight. Trail shoes are generally made of a molded plastic, and all shoes can come with attached or removable flotation blades. The weight, or load, is an important number to keep in mind. While your body and clothing may only reach 150 pounds, if your pack and luggage add another 50 pounds, shoes rated for 170lbs. won’t do you much good. Keeping in mind how much total load will be on the shoes will help you decide which pair to purchase. The crampons need to be sturdy yet flexible. They should be able to punch through ice that forms on top of the snow to allow you added traction. Most crampons are made from aluminum alloy or stronger carbon fiber. When it comes to bindings, you should look for nylon or Nytex style that will form to your foot, or boot. The fewer pressure points you have, the more weight is distributed around the frame, keeping you on top of the snow. While molded bindings may be more comfortable to slip your boots into, they won’t give as much and will cause more fatigue. You also need to look at the binding’s lashings. Velcro, dial locks and slip joint closures are all common strap types to keep your foot in the shoe. If you plan to use these shoes constantly, season after season, you should ensure that the lashings are durable enough to withstand the long duration at freezing or below freezing temperatures. When searching for the best snowshoes for your needs, you have a lot to consider. Everything from your budget to the fit needs to be assessed. Most importantly is the frequency of use measured by the durability of the construction materials and the maximum load the shoes can handle. Making sure you have the right size to maintain the loads you will be placing on them will make for a better experience. When it is all said and done, though, the right shoe for you will be the best overall in as many categories as possible. Our list should provide you with a great starting point with all of your questions answered. We are confident that your next pair of snowshoes is somewhere in this list.